« What’s new in 2011? This entry was posted on April 4, 2011 at 11:42 am and is filed under Uncategorized. You can follow any responses to this entry through the RSS 2.0 feed. You can leave a response, or trackback from your own site. WHEN does this come out!?!?! this just made my day! Not only have i been waiting for this book… FOREVER it feels like, it comes out right before my birthday! Perfect! it’s a bittersweet kind of feeling. Can’t wait to get more updates! Will Zin be coming back? She was great! Can’t wait for everfound! hey neal.. i translated the first chapter of unwind into italian last year for a translating competition.. it caught me so much that i couldnt help but order the book from amazon. ive gotta say its one of the best books ive ever read. so real, so well developed this whole idea of the unwinding process. and i really liked the three main characters, the way they were and the way they “grew up” throughout the story. i went through everlost and everwild last month and -although unwind remains my favourite- im looking forward to the third book. No you dont have to miss nick remeber what micky was doing at the end of the book? sculpting him. the one i will miss is zin. but im with you im like on th verge of not sleeping waiting fo this book! ugh!!! Oh my freaking god. ITS HAPPENED! EVERFOUND has had its FIRST REVIEW! WE should make a holiday, banks closed, schools on vacations, parades broadcasted on TV all to the HONOR OF THE FIRST EVERFOUND REVIEW! OMG, cant wait for the book! actually, i got Everlost last year on Easter and got EverFound when that came out too. I have come full circle. my life is complete. im sending a letter to Obama, we seriously need a reading holiday. How does that sound? I didn’t think everwild went as far as to explain mary was on a glass coffin, I thought it ended with Milos taking out the knife and Mary saying, “Take me home, my love” Am I wrong? Is there a different version with a slightly extended ending? your not wrong.. I have NO idea where the coffin came from.. I can’t believe what happened to Mary at the end. It really took me by surprise, but at the same time, it’s exactly what would happen. But what ever happened to Zin? Hi, it’s the same person. 🙂 I just wanted to tell you that I finished it and I nearly burst into tears near the end of the book. But I just love how everything falls into place so perfectly. Amazing job! I’m supremely glad that Kirkus gave this the accolades it deserved. I zipped through this last volume with the energy one has upon opening Christmas presents: speedy enough to be swept in the emotional turmoil, but slowly enough to savor the character development and attention to detail. Never has a novel aimed at “young adults” simultaneously brought me to so many boughts of weeping, laughter, and soul-searching. Thank you for revealing the reality and humanity that spring from stories labeled as “Fantasy”. I’m SO excited! I’m waiting for the prefect day to start reading it! But what I want to come out more than anything is Unwholly! I just finished reading it!!!! was definitely the best book in the series!!!!! I LOVED IT!!! the ending was AMAZING! Yeah, after the ending of Everwild, I was literally speechless and had trouble thinking. My mind was stuck on the final scene and I could barely move. I stuttered to my sister, “Oh my GOD! Start reading NOW the ending is EPIC!” Congratulations for making the perfect cliffhangers. When I bought Everfound yesterday I couldn’t hide my grin when I held it in my hand and knew it was MINE! I love this book so much. 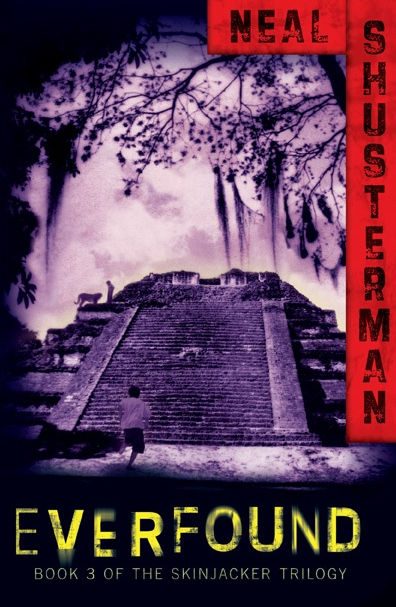 Mr. Shusterman you have written a masterpiece. I laughed, I cried and I wanted to rip Mary Hightowers head off.